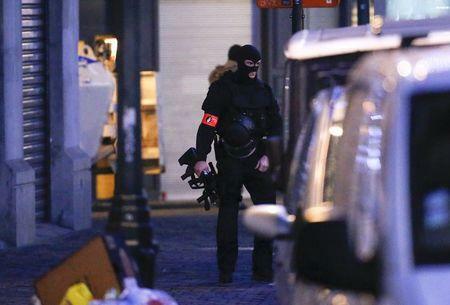 BRUSSELS (Reuters) - Belgian police on Monday released five people they had detained following raids on homes in Brussels as part of investigations linked to attacks in Paris that killed 130 people in November, prosecutors said. On Sunday evening police raided a building near the fashionable Dansaert district of central Brussels, detaining two brothers and their friend after an analysis of phone records. Another search was carried out on Monday in the Laeken area of Brussels, in the north of the city, where two more people were detained. Late on Monday, the prosecutor's office said in a statement all five had been released. Following the Nov. 13 attacks in Paris, the focus of the investigation turned to Belgium, where several people suspected of having aided the attackers have been arrested. Fugitive Brussels native Salah Abdeslam, who is suspected of direct involvement in the Paris attacks, is still at large.